Tweetsie Officially Opens For The Season On April 30th! Tweetsie Railroad, North Carolina’s first family theme park, opens for the 2010 season on Friday, April 30th. Come join the fun!! 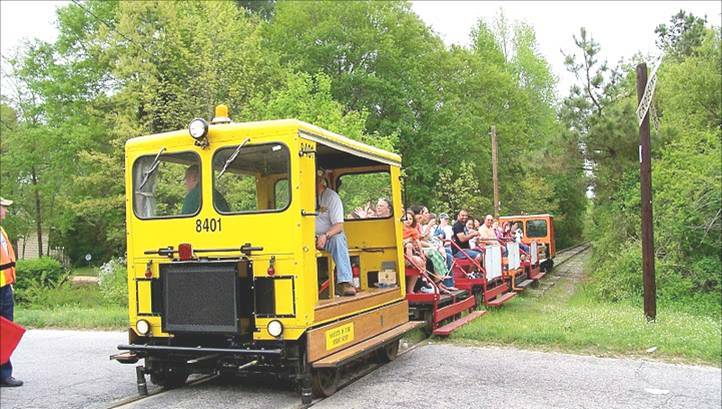 Opened in 1957, Tweetsie Railroad began as an excursion train ride aboard steam locomotive #12, the only surviving narrow-gauge engine of the East Tennessee and Western North Carolina Railroad (ET&WNC). Built in 1917 by the Baldwin Locomotive Works, #12 is a 3 ft (914 mm) (narrow gauge) 4-6-0 coal-fired locomotive that was used to haul passengers and freight over the ET&WNC’s 66-mile (106.2 km) line running from Johnson City over the Appalachian Mountains to Boone, North Carolina. After the narrow gauge portion of the ET&WNC ceased operations in 1950, the locomotive was purchased by a group of railroad enthusiasts and was taken to Rockingham County, Virginia to operate as the small “Shenandoah Central” tourist line in 1952. Floodwaters from Hurricane Hazel washed out the Shenandoah Central in 1954, and Locomotive #12 was once again put up for sale. Hollywood actor Gene Autry considered purchasing the locomotive to move to California for use in motion pictures. 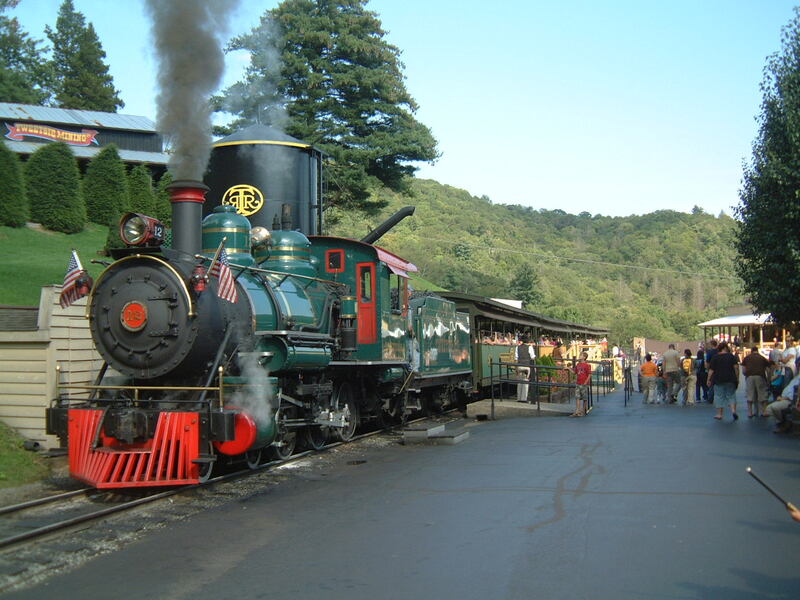 Instead, Grover Robbins, an entrepreneur from Blowing Rock, North Carolina, bought the locomotive in 1956 and moved the engine back to its native Blue Ridge Mountains as the centerpiece of a new “Tweetsie Railroad“ tourist attraction. A 3-mile (4.8 km) loop of track was constructed near Boone, North Carolina for the train to run on, and on July 4, 1957, the locomotive made its first public trip over the line. 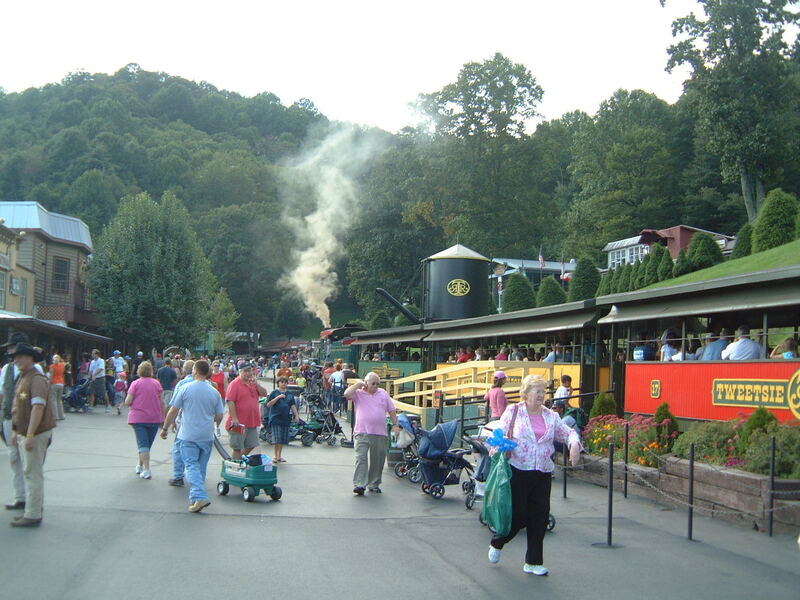 Tweetsie Railroad became a popular tourist attraction, and evolved into one of the nation’s first theme parks. A western town and saloon were built around the depot area. A train robbery and Indian attack show were added to the train ride, playing off the Wild West theme that was very popular at the time on television and movies. The theme was enhanced by regular visits WBTV television personality/singing cowboy Fred Kirby, who hosted a popular children’s show. In 1962, a chairlift and amusement ride area was constructed at the top of the mountain inside the rail loop, and over the decades the park has been expanded with additional rides, attractions, shops, restaurants, and special events. One of Tweetsie Railroad’s two steam locomotives, 2-8-2 #190, on May 20th, 2007.The Tweetsie Railroad theme park is open from early May through October of each year. One of its most popular annual events is the nighttime “Ghost Train Halloween Festival” in October. In addition to the Wild West train adventure and the amusement rides, Tweetsie Railroad has a variety of live entertainment shows featuring talented performers selected from the immediate area and from the Southeast. Tweetsie acquired another steam locomotive, USATC S118 Class 2-8-2 #190, the “Yukon Queen” from Alaska’s White Pass and Yukon Route in 1960. Built by Baldwin Locomotive Works in 1943 for the US Army, the engine was part of an 11-locomotive fleet of “MacArthur” 2-8-2s originally purchased for use overseas. During World War II, the locomotives were sent to Alaska for use on the White Pass and Yukon. 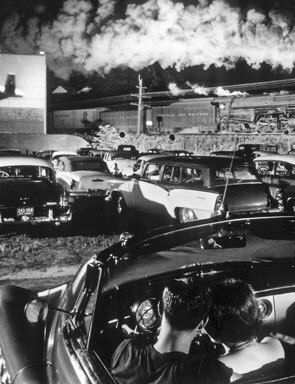 In 1961, Grover Robbins built another train ride and tourist attraction called “Rebel Railroad” in the Smoky Mountains near Pigeon Forge, Tennessee. Renamed “Goldrush Junction” in 1966, it was sold to the Cleveland Browns football team in 1970. In 1976, the attraction was sold again to Jack and Pete Herschend of Branson, Missouri, who redeveloped it as a theme park, “Silver Dollar City Tennessee”. In 1986, country music star Dolly Parton became a partowner with the Herschends, and the theme park was renamed Dollywood to reflect her involvement. The name “Tweetsie” was given to the original East Tennessee and Western North Carolina Railroad by area residents who became accustomed to the shrill “tweet, tweet” of the train whistles that echoed through the mountains. The nickname stuck with the train and became more identifiable than the railroad’s actual name. 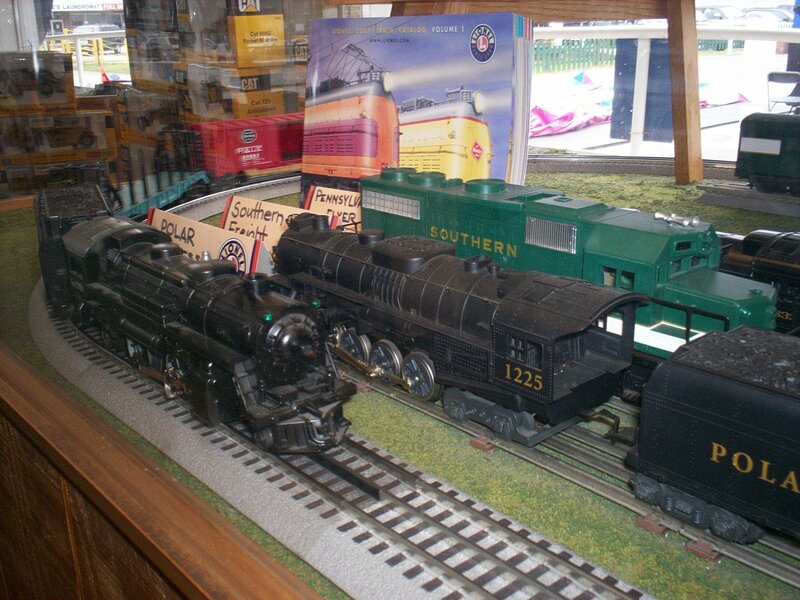 For the past year I’ve been compiling a list of model train stores for my model railroading website. These shops all look like a lot of fun to visit, but what are the most popular? Here is a list for the states of North Carolina and South Carolina. Hobby shops not quite making my top 10 were ABC RC Hobby in Forest City, North Carolina; Chuck’s Trains in Landis, North Carolina; Dry Bridge Station in Mount Airy, North Carolina; Hayes Hobby House in Fayetteville, North Carolina; Leland’s Toy Trains and Planes in Hildebran, North Carolina; Zoo Toys and Trains in Wilmington, North Carolina; Hobby Station in Bethune, South Carolina; New Brookland RR and Hobby in West Columbia, South Carolina; SVC Trains in Georgetown, South Carolina; and The Great Escape Bicycles and Hobby Shop in Spartanburg, Anderson, and Greenville, South Carolina.